This week I will be using the digitised newspapers on Trove in an attempt to help narrow the date range for another photograph in the carte de visite collection. On the back of one of the photos is the name of Brisbane based photographers Metcalfe & Glaister. From the details provided on the photo, Metcalfe & Glaister operated a studio in Queen Street Brisbane. 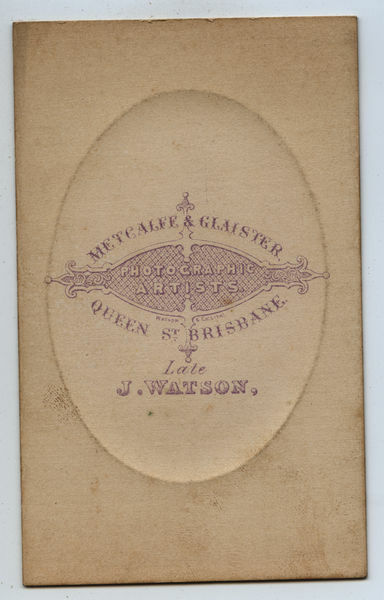 According to a public notice printed in The Brisbane Courier in 1875, Metcalfe & Glaister took over the business of J. Watson from 23 April, offering a range of new styles of photographic portraits. According to The Queenslander, the pair entered the 1875 Queensland Exhibition held on 8 July, with Metcalfe & Glaister receiving a Certificate of Merit for photographic portraits. A distressing case of poisoning occurred in this city on Wednesday morning. Mr, Glaister, of the firm of Metcalfe and Glaister drank a quantity of cyanide of potassium (a chemical used in the photographing business), and died from the effects of the draught in about an hour. It is believed that he mistook the chemical for gin, as he had only a short time previously sent out for a glass of that spirit. He was from thirty to forty years of age, and has left a widow and child. A year later, there are still reports of the Metcalfe & Glaister business operating under that name - The Brisbane Courier reported in July 1878 on the display of the relatively new format cabinet and coloured photographs. 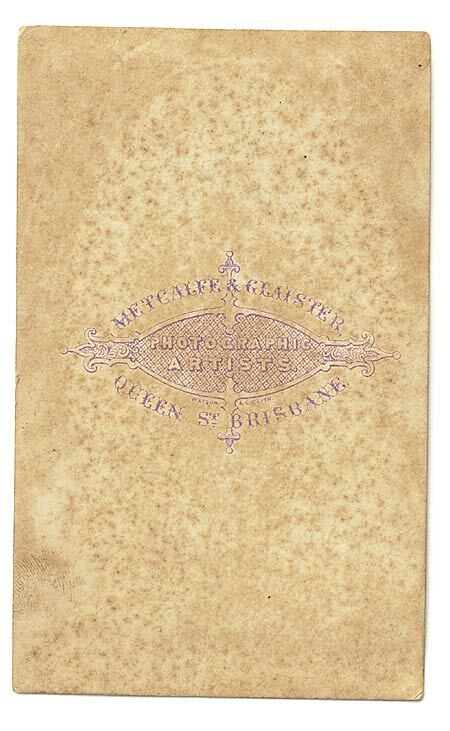 Within several months however, the photographic name of Metcalfe & Glaister was replaced by Metcalf [sic] & Bennett in a new studio location in the Smith's Buildings, Queen Street, Brisbane. Based on the above information, the photographers Metcalfe & Glaister operated from their Queen Street, Brisbane studio from April 1875 through to August 1877. That said, it would appear from the newspaper articles referenced that the business kept operating until October 1878 under the Metcalfe & Glaister name. Conservation Architect Peter Marquis-Kyle has two fine examples of back imprints of carte de visite photographs by Metcalfe & Glaister in his online collection. The first example is very similar to the back imprint displayed above, except there is no "late J. Watson", indicating that it is of a later date. The second example shows rather elaborate text and scroll work covering the full back and angled at forty-five degrees, indicating a later period again than the first example. Based on the information collected and the rear imprint examples of other Metcalfe & Glaister work cited, I would put a year date for this photo as 1875.